Oooh, pretty! Shiny! Sparkles! Glitter! But can you put it in soap or cosmetics? The FDA regulates color additives that may be used in cosmetics, and “glitter” is not on the list. In fact, the FDA says that glitter is not an approved color additive. BUT, you can see glitter in all sorts of commercial cosmetic products … so what’s the deal? I did some digging, and here’s what I found out. The FDA must approve any color additive to be used in foods, drugs, cosmetics or medical devices. Not only do they approve whether the color additive may be used at all, they also specify how it may be used. For example, mica may be used anywhere, but henna is subject to limitations for external use and may not be used generally (including lips) or the eye area at all. The FDA publishes a concise summary list, Color Additives Permitted for Use in Cosmetics. Glitter is not on the list. Composite pigments: Color additives used in combination to achieve variable effects, such as those found in pearlescent products, are subject to the same regulations as all other color additives. Some color additives, when used in combination, may form new pigments, which may not be approved for the intended use. An example is a “holographic” glitter, consisting of aluminum, an approved color additive, bonded to an etched plastic film. When stuff is combined together to make a new pigment, it must have its own approval — even if the parts it was made of are approved as color additives on their own. Glitter is usually made by bonding a colorant (approved or not) to metal or plastic and then cutting it up into tiny little shiny pieces. Pearlescent colors are made by combining mica with colorants and/or other shiny stuff (like fish scales or mother-of-pearl). And neither glitter nor pearlescent colors are actually approved for use in cosmetics. But, but … they are used all the time! So true. A search at Amazon for “glitter” in the Beauty & Personal Care category showed 29,953 results! How can that be? A Google search led me to 2012 blog post by Phyrra, a beauty, fashion and lifestyle blogger, in which she tried to track down the FDA’s position on glitter after she read information from TKB Trading. Phyrra’s post has been quoted all over the web in discussions about glitter and pearlescent colors and seems to have the only from-the-horse’s-mouth data from the FDA. 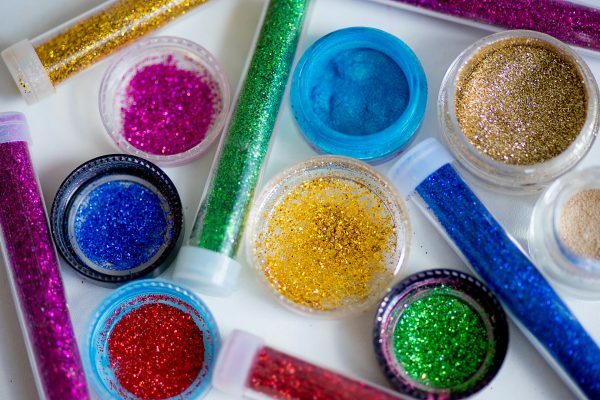 FDA considers glitter and mica-based composite pigments to be non-permitted color additives when used in FDA-regulated products, including cosmetics. However, we are exercising enforcement discretion for a period of time. … Once the enforcement discretion period is over, FDA will resume our enforcement of these non-permitted colors. The regulatory status and safety of glitter, mica-based pearlescent pigments, and other composite pigments used in cosmetics are currently under discussion while we are exercising enforcement discretion for these color additives. Enforcement discretion means that we will allow products into the US that contain certain non-permitted color additives, like glitter, while we continue to review data submitted through the petition process and gathered by other means. Once we have completed our review and made a determination, the enforcement discretion period will end. A search (actually, a LOT of searches) of the FDA website and Federal Register to learn more about this “enforcement discretion” came up with zip. Nothing official on the website that says when this enforcement discretion started, who approved it or when it will end. Obviously the large, commercial makeup companies that produce glitter or pearlescent cosmetic products think the ingredients will ultimately be approved for use — otherwise they probably wouldn’t have invested the many thousands (or millions?) of dollars researching their products and getting them on to the market. Or maybe they think they can make enough off the products to compensate for any losses if their products have to get pulled. In any event, the market is saturated with sparkly, shiny, pretty cosmetics that use non-permitted color additives. Sheesh. It’s apparent that the FDA doesn’t think that glitter or pearlescent color additives are sufficiently unsafe to make it a problem if they are used in cosmetic products. That’s understandable if you look a little deeper. “Cosmetic grade” glitter, is usually made from polyurethane terephthalate (PET) plastic and aluminum which are then tinted with various colors and shredded into tiny pieces. This type of cosmetic grade glitter (provided the colors used are already approved) is – I’m pretty sure – approved for use in cosmetics in the EU1. So, in a way it seems that the FDA could be justifed in excercising “enforcement discretion” while they get their ducks in a row to create specifications and usage amounts for cosmetic glitter. Craft Glitter – Is It a Problem? Yes. YES! Definitely and emphatically, YES, IT IS A PROBLEM! Unlike cosmetic glitter, which is made with soft plastic and cut into very small pieces with clean, often rounded, edges, craft glitter is usually made of metal and has sharp edges and pointy corners. Certainly NOT the sort of thing you want to get in your eye. Just see what happed to this poor woman, when one piece of craft glitter got in her eye when she was cleaning up. Hint: she has only one eye now. Then, besides the fact that craft glitter is like teensy-tiny little knives, it is often colored with color additives that are not approved for use in cosmetics – making it a double no-no. Glitter and pearlescent micas are not approved for use in cosmetics in the US. As of July, 2012, the regulatory status of glitter and mica-based pearlescent pigments was “under discussion” and FDA was exercising “enforcement discretion” for them. There doesn’t seem to be any additional information publicly available from the FDA on the current status of glitter and pearlescent micas as color additives in cosmetics. “Cosmetic grade” glitter is approved for use in the EU. The Cosmetic Ingredient Review Board has found PET safe for use in cosmetics, including as a component of glitter. Cosmetic grade glitter and craft glitter are very different; craft glitter should never, ever, be used in cosmetic products. Last, but not least, I have put in a Freedom of Information Act request to the FDA, asking for any information about the “discretionary enforcement” of glitter and pearlescent as non-permitted color additives (as well as some other areas that appear to fall under discretionary enforcement by the FDA). I’ll let you know what I find out! 1. ↑ I’ve seen this information on several websites, but have not – as yet – been able to find the EU regulations that specifically say it is allowed. This is exactly what I was told by the FDA when I contacted them several years ago, when I first started working with (what Soapmakings call) micas since they aren’t approved color additives on their list. I was specifically told that as composite products, if the components are individually approved, they would fall under “discretionary enforcement” (as is the case with “micas”). I didn’t ask about glitters since I don’t use them, so that’s surprising! Thank you so much for sharing this Marie! This is a little known thing in our industry. As a supplier, it is also what gets my hackles up about people that have little knowledge of color selling glitters and micas. They are technically not approved and we need to be very careful in sourcing our products, as these products are approved by the FDA on a case-by-case basis. What separates cosmetic micas and glitters is the color additive used to pigment them. If the color additive is cosmetic grade, the FDA will most likely let it pass. If it is not, the FDA will put on the brakes – FAST! Additionally, buyers should also be aware of these fine details in regulation and be very careful when buying these products to ensure no rules are being broken. Thanks again! For what it’s worth, I work at a Gov Agency, in the Enforcement Unit, where we are given ‘Enforcement Discretion” (ED) with regard to environmental issues. There is nothing hidden here, ED means just that, enforcement is at the ‘discretion’ of the agency or officer. ED is usually invoked when it’s not worth the time/trouble/funding to pursue enforcement. A law/rule/policy has been violated or ignored, intentionally or unintentionally, but we also now that some laws/rules/policies are impossible to enforce should not have been written in the first place, or, are allowed in many other places and therefore a facility may have made a reasonable assumption that it was allowed here. These non-compliance infractions are labeled de minimus and that’s where the ED card is played. I assume the FDA works the same way. ED can and has been abused, generally when there is a personal vendetta with an Enforcement Officer. With regard to glitter in soaps, I just can’t see FDA investing time/funding on this issue, given the ‘Bottom Line’ info above. In your experience, is there anything written giving enforcement discretion on “this” regulation and not “that” regulation? Enforcement discretion is across the board but not often used for ‘big issues’ and/or big companies. ED is most commonly used when someone is required by law to do something, they don’t do it, we tell them time after time to do it and they still don’t, we start enforcement actions and find out they are not even financially capable of doing it and voila, this easily moves into the ED area. Can’t get blood out of a rock, even with court action. And, sometimes when court action is taken, the fine/fees/settlement is suspended or defered by ED. It’s very important for government regulators that these type of rules stay as vague as possible and the ED is never defined or described in writing. It may not make sense, it may not be helpful to you but that is how government agencies function. Yes, it makes it difficult for those trying to follow the rules, mostly “little guys”. The ‘big guys’ all have law firms on staff that play the same nonsense games as the government so at the cost of millions we go round and round with them for years on just one issue. It’s bureaucracy and it’s frustrating and “it shouldn’t be that way” but sadly, it is. This is very interesting, considerin I have been applying glitter make-up to my eyes for many years…and big companies are making big bucks with this stuff..
An additional issue with cosmetic PET or PBT glitter is that it’s made of the same plastics that micro beads are made of so any glitter used on bath and body products washes into the ocean where it contributes to the plastics that pollute and degrade the ocean. Plastic glitter doesn’t seem to be on the radar as the pollutant it is, possibly because everybody thinks they don’t use very much. There is a biodegradable glitter made by a company in the UK that is made of cellulose. Very good point to keep in mind! Good thing soap is not a cosmetic. The bio-glitter (tradename) that is produced in the UK is also being subject to questions about it’s toxicity to marine and freshwater life. The celluose material it uses has been declared >90% biodegradable but the finished product has not been tested for toxic effects. Since most body art glitter gets washed off into the waste water system or into lanfill via plastic facewipes, the effects in our sewage treatment plants and on our lower life forms need testing before we can claim use it as a credible alternative to microplastic glitter. All plastic glitter should be banned immediately. It is not part of any circular economy and is therefore a waste product that is of no inherent benefit to anyone except someone who cares more about their temporary appearance than their immediate environment. The jury is out on bio-glitter until more tests have been done. Sorry but could anyone tell me is there any definition of cosmetic grade glitter? So a cosmetic grade glitter containing permitted colorants is subject to enforcement discretion? But for PET glitter used as body glitter containing non-permitted colorants, it is a clear non-compliance. Please correct me of i get it wrong. Thank you. There is no such thing as “cosmetic grade glitter”of “pet glitter”. There IS glitter that complies with the FDA regulations as a color additive for cosmetics. It must contain color additives that are approved for the specific use (ie if being used around the eyes, then it must contian color additives that are approved for eye-area use). There is also glitter that doesn’t comply the the FDA regulations for color additives for cosmetics. No matter what it’s called, but bottom line is whether the component color additives are approved for use in cosmetics and are approved for the specific use of the cosmetic.